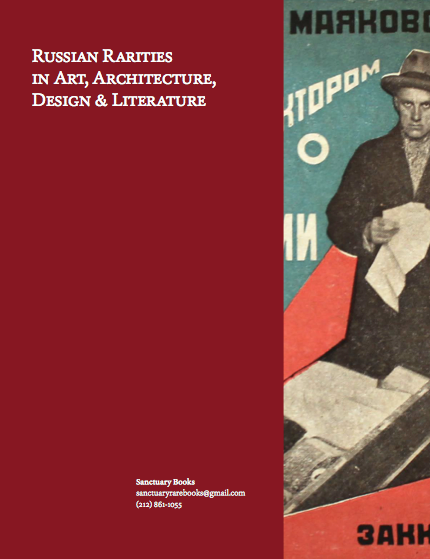 A bonus catalogue featuring 34 important works of the Russian Avant-garde and Constructivism. Major art, design and literary figures of the early twentieth-century are present such as Vladimir Mayakovsky, Alexander Rodchenko, Valentina Kulagina, Gustav Klutsis, El Lissitzky, Ilya Selvinsky and Boris Pasternak. Highlights include A Game in Hell: A Poem (Igra v adu: Poema), one of the rarest works of the Russian Avant-garde, first issued in 1912, the first collaboration between Aleksei Kruchenykh and Velimir Khlebnikov.